How many times have you downloaded a model, sliced it and then discovered that the darned thing is not touching the bed? It's either hovering a few 1/10s of millimeters above the bed or, worse, slightly tilted so part of the base touches the bed and the rest does not. Seems to happen to me more times than I like. 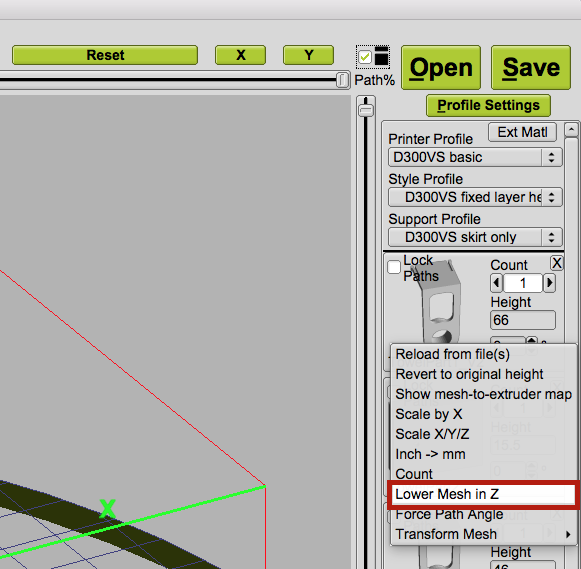 So, a cool feature in KISSlicer called Lower Mesh in Z gets my #10 spot for why I love KISSlicer! Simply right mouse click (Control click for OS X users) on the model panel to access the handy menu. Then select the Lower Mesh in Z option. Enter the distance you want to lower the model in the dialog. NOTE: a positive value in the dial LOWERS the model. So, if you wanted to raise the model for some reason (maybe the model's base is below the Z=0 plane), simply enter a negative number. I recommend you give this a try and enter a large value like "25" simply to see it in action. Once you understand what - and how - it performs its task, you'll never be frustrated by models with bad bases again! 1 comment to ''Why I love KISSlicer: Reason #10"
For inexperienced modelers like myself, I actually used it to print the first two layers of a pokeball. I have support issues and cannot create proper z-gaps in Kisslicer 1.6.2 so when I tried to remove the support, the first two layers of the model was removed. Instead of printing again I shaved the ruined layer flat, printed a new first two layers and superglued it to the print.